We have been asked numerous times how Jim creates his beautifully faceted gemstones. Well, in today’s blog, we hope to give you a better idea of what takes place. First of all, he starts with a crystal or, in this case, a piece of a citrine crystal. This piece is just the tip of the crystal where the side facing you is the actual point, with six sides. He then holds the crystal, by hand, on the grinding wheel of the faceting machine to preform it by removing excess and apparent flaws. Next he heats wax on a dop and attaches the preformed shape to the dop. The dop and wax are what hold the crystal in place while it is being ground into its shape. As a side note, the dopping process can be a bit problematic. Some crystals can crack just being exposed to heat. In those cases, a very strong glue might be needed. If the crystal comes off the dop during the course of cutting, it is nearly impossible to get it put back on in the exact same spot and often leads to starting over, and ending up with a much smaller gem. Jim decided he was going to cut the citrine into a Standard Brilliant, which is a very common cut. Most of the gemstones you see in your neighborhood jewelry store are a Standard Brilliant. Jim does a mixture of cuts: some are designs that can be found in books, sometimes he will modify the designs in the books, and other times he creates his own cut. Many of the gemstone cuts require that one begin by cutting the bottom of the gem, otherwise known as the pavilion. It’s the angles in the pavilion that reflect the light back out the top of the gem. After cutting the pavilion, while the gem is still on the dop, the girdle is also cut (the girdle is the small area around the circumference of the gemstone). Both the pavilion and the girdle are polished using various grades of diamond-embedded plastic. Below photos show the pavilion cut, the girdle after it has been cut and Jim polishing. 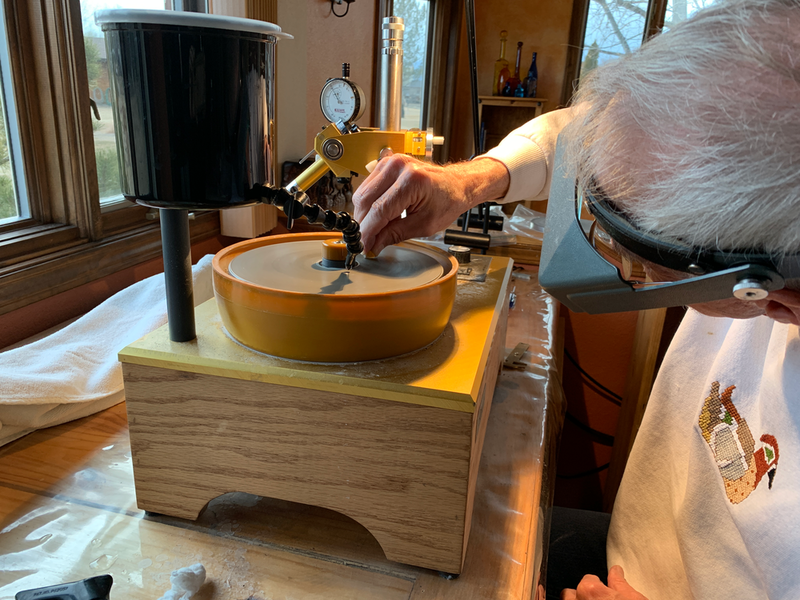 Now it is time to transfer the gemstone to another dop, in preparation for cutting the top of the gem, known as the crown. For transferring, more wax is heated on another dop, and the device in the photos below is used to bring the two dops together while the wax is soft. This device holds the gem in place until the wax on the new dop hardens (sometimes a bit of glue is used in addition to the wax, to ensure the gem doesn’t come off while cutting). Once the wax hardens, the two dops are removed from the device. Using a razor blade, the dop that is holding the pavilion is cut away from the wax on the original dop to expose the surface that will become the crown. Then, using the instructions in the book that tell the angles for cutting the crown, he goes to work cutting and polishing all the many facets that make up the top. If you’ve ever looked into the eye of a gemstone, you’ve seen there are a lot of facets. Below is the finished citrine which shows its beautiful, rich dark orange color. Thanks for checking out our blog today. We hope this gives you a slightly better idea of how these beautiful gems come to be. You probably recognize most of the gemstones in the rings in this photo. In fact, most are quite popular and well known. The orange gems of various shades are citrine, also known as a November birthstone. The light and dark purple gemstones are amethyst, also known as February’s birthstone. The brown or grayish-brown stone is smoky quartz. And, lastly, the green gemstone is known as vermarine or prasiolite. All of these gems have one thing in common. If you’ve already guessed it, then you know much more than I did when I first started making jewelry. All of these gemstones are quartz. My knowledge of quartz used to be limited to smoky quartz, clear quartz or rose quartz. Never had I considered amethyst, citrine or vermarine as being of the same mineralization, which is silicon dioxide. Most of the citrine on the market is actually heat treated amethyst and so is the prasiolite (vermarine). Amethyst is found in many locations around the world, such as Brazil, East Africa, Arizona, California, Colorado and Canada. Brazil also produces some of the best citrine, although it is heat treated amethyst. Natural citrine can be found in Madagascar and Mexico, while prasiolite (vermarine) comes from a single amethyst mine in Brazil and, as mentioned, is heat treated. Smoky quartz and rose quartz are found in many locations. This knowledge has certainly changed how I view these gemstones but it hasn’t changed my appreciation for their beauty.